Thai businessman, Vichai Srivaddhanaprabha, who personally bankrolled Leicester City's rise to Premier League champions, has died in a helicopter crash alongside four others. Leicester City have confirmed that their chairman, Vichai Srivaddhanaprabha, was among five people killed in a helicopter crash on Saturday night, SkySports reports. The 60-year-old Thai businessman was on board his own personal helicopter, which lost control and crashed in a car park at the King Power Stadium following Saturday's match against West Ham. Leicestershire police say the other four victims of the crash are believed to be two members of Srivaddhanaprabha's staff, Nursara Suknamai and Kaveporn Punpare, pilot Eric Swaffer, and second pilot Izabela Roza Lechowicz. "None of the five people on board survived. The primary thoughts of everyone at the club are with the Srivaddhanaprabha family and the families of all those on-board at this time of unspeakable loss. 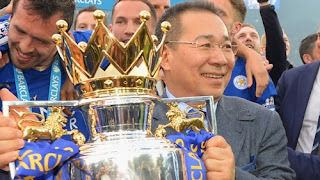 "In Khun Vichai, the world has lost a great man. "A man of kindness, of generosity and a man whose life was defined by the love he devoted to his family and those he so successfully led. Leicester City was a family under his leadership. Srivaddhanaprabha, who founded the retail company, King Power Duty Free, bought Leicester in August 2010 and became the club's chairman less than six months later. The Leicester statement added: "A book of condolence, which will be shared with the Srivaddhanaprabha family, will be opened at King Power Stadium from 8am on Tuesday 30 October, for supporters wishing to pay their respects. "Both Tuesday's First Team fixture against Southampton in the EFL Cup and the Development Squad fixture against Feyenoord in the Premier League International Cup have been postponed.